We are living in an age of miracles. This week, a simple groundhog predicted the weather with every bit as much credibility as highly-paid government climate scientists... Mitt Romney got the endorsement of a monomaniacal reality show host with really, really bad hair and expected conservatives to be happy about it... and Barack "Damn, I Love Abortion" Obama attended the National Prayer Breakfast to try to convince potential voters that he actually looks up to God. And you know what? We're not buying it. And why would someone who brags about being devout sneeringly tell liberal donors behind closed doors that he sees other members of his alleged faith as "bitter" people who "cling to their religion?" 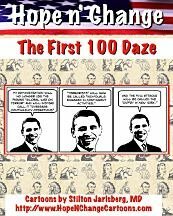 Now throw in the radical anti-American anti-White tirades of Obama's "spiritual mentor" Jeremiah Wright, and the president's well-known preference of golf to church, and it becomes fair to question whether this president is actually a Christian or just a (perhaps literally) damned liar. Full disclosure time: Hope n' Change Cartoons isn't affiliated with any religion, but we deeply respect the faith of others - especially when that faith is exhibited in actions which help others and reflect strong and unapologetic morality. But we certainly haven't seen that from Barack Obama. 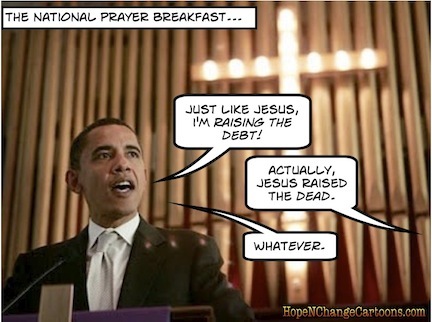 So despite Obama's claims at the prayer breakfast that his policies are essentially identical to those of Jesus Christ (albeit with a lot more fines, regulations, backroom payoffs, and waivers), we're just not buying his shtick. For one thing, every time he said anything good about Christianity at the prayer breakfast, he had to hurriedly point out the parallels to the glorious beliefs and teachings of Islam. And - oh yeah - Judaism, Hinduism, and the writings of Plato. The wisdom of Mormonism didn't come up, but the Bamster has probably already written off the vote from Salt Lake City. Moreover, "love thy neighbor as thyself" was never intended to be written into the tax code as justification for redistribution of wealth (as B. Hussein suggested to his audience). And wasn't there a little something in the Bible about not coveting anything that belongs to your neighbor? Maybe Obama hasn't read that part yet - and it never came up in 20 years of Wright's screaming sermons. Meanwhile, many Catholics are seething mad about Obama's so-called "War on Religion" which is forcing churchgoers and Catholic charities to accept abortion and birth control in violation of their beliefs...and in clear violation of the Constitution's First Amendment: "Congress shall make no law respecting an establishment of religion, or prohibiting the free exercise thereof." But as is seemingly the case with his Bible, perhaps Barack Obama hasn't read that far into the Constitution yet. Or, as is seemingly the case with his Bible, he's also lying about believing in the Constitution. Because there weren't already enough reasons to smash our heads into our desks until we see stars, hear chirping birds, and spill our coffee and/or whiskey, commentator Juan Williams has just produced an editorial in which he outlines the new racist codewords being used by the GOP. Mind you, these aren't the highly-offensive old racial epithets used by Stephen Foster, the Ku Klux Klan, and every rapper in America. No, these are new "top secret" racial insults which are meant to fly under the radar by bigots who don't support Barack Hussein Obama. For instance, Juan says that when Mitt Romney refers to our "entitlement society," it's racist. When Newt Gingrich refers to our "food stamp president" (who just offered a $75,000 bounty for new ideas to add more people to the food stamp rolls) it's racist. It's also racist when Newt uses the phrase "poor work ethic," but it was not racist when Barack Obama referred to Americans as "lazy." And it gets worse. It turns out that any words or phrases which are frequently used by conservatives are, by definition, racist codewords. For instance, Williams cites "old-fashioned American values," "Founding Fathers," and "Constitution" as being terms which should not be used in polite company or political debate. 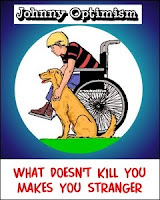 So widespread is this phenomenon - which will only grow as November approaches - that noted MSNBC lunatic Chris Matthews has given it a name: "dog whistle racism," which nobody can hear except liberals with super-keen powers of detection. Which is how Matthews was able to pick up on yet another new racist codeword, which was shockingly uttered by KKK Grand Wizard Newt Gingrich on live television. The word was (and we wish we were kidding)..."Juan." Way back in 2009, Barack Obama declared that his administration, unlike that of George "Everything Is His Fault" Bush, would be about "ensuring that scientific data is never distorted or concealed to serve a political agenda — and that we make scientific decisions based on facts, not ideology." Which should make for some pretty interesting non-political decision making now that climate scientists have declared that there has been no global warming in the past 15 years, and we seem to possibly be entering a new mini-Ice Age owing to a downturn in solar activity. Some scientists believe that we're in for colder temperatures, shorter growing seasons, and harsher winters for the next half-century or more. Fortunately, the entirely non-ideological man in the Whitehouse has been busily making science-based decisions to help Americans cope with the extreme cold wave heading our way. Not by allowing more fossil fuels to be mined or drilled, of course. Nor by allowing additional exploration for such fuels. And of course, he's against pipelines which might bring much-needed oil to our refineries. 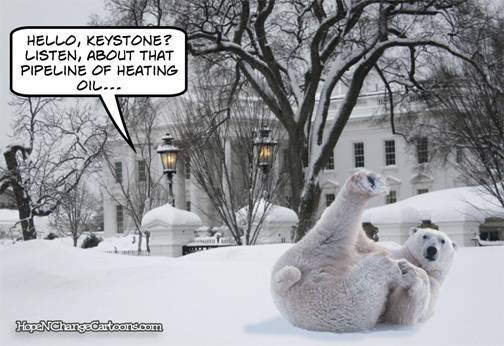 Instead he continues to dump large quantities of taxpayer money into "green" technologies which will keep us all toasty and warm...if any of them can be made to work before we freeze to death. Oh sure, the president's huge gamble with Solyndra went belly up in a hurry, but fortunately he'd also had the foresight to invest our tax money in Evergreen Energy - which remained robustly healthy until they'd finished spending our cash and went out of business last week. But knowing that a "Plan A" and a "Plan B" can both fail, Mr. Obama had also funneled our money into "Plan C" - a company called Ener1 which made batteries for electric cars like the Government Motors Exploding Chevy Volt...until they declared bankruptcy last week. In fairness, the president's high-tech green energy investments haven't all gone bankrupt. Amonix Inc - yet another maker of solar panels - announced that thanks to $5.9 million in stimulus funds, they were able to keep their doors open for a full seven months before laying off two thirds of their workforce last week. With all of these shutdowns and breakdowns in the last seven days, you'd think the president would have said something in his State of the Union speech about green energy. And in fact, he did - recommitting himself to dumping billions more of our tax dollars into wind, solar, and other esoteric technologies in order to create energy sources which will definitely not cause the Earth to warm. No matter how much we'll wish they could.